MWAH mixes music, advice on youths' toughest issues | MWAH! 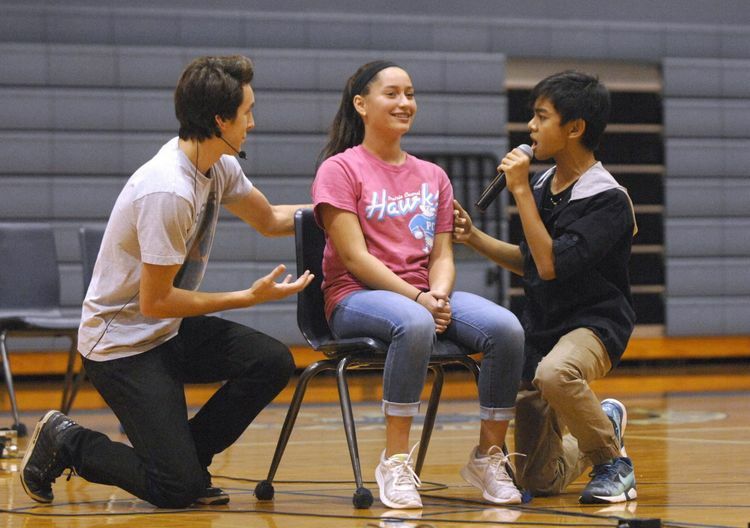 Michael Henehan and James Agena, of the musical troupe MWAH, serenades Prairie Central Junior High School eighth grader Ayva Alvarenga, 14, during a presentation Monday at the school in Forrest. MWAH mixes music from a variety of popular culture icons with serious messages for students in their audience. FORREST — When Prairie Central Junior High School Student Council adviser Jonnita Vogel first saw the MWAH Performing Arts Troupe at a student council state convention several years ago, she immediately felt a connection. During a 90-minute assembly Monday at the school in Forrest, members of the group discussed racial divisiveness; abusive relationships, including those between parents and children and boyfriends and girlfriends; parental divorce; and teenage self-injury and suicide. McLean County Coroner Kathy Davis also spoke to the 300 PCJHS students about opioid deaths, driving under the influence and suicide. The troupe — its name is short for Messages Which Are Hopeful — consists of junior and senior high school students who use song, dance and sketches to deliver inspirational messages of hope and love to other students, empowering them with knowledge, courage and strength to deal with life’s challenges. The troupe performs regularly for schools throughout the state of Illinois and has been booked at Prairie Central in previous years, Vogel said. Moffitt founded the group in 1983 with cassette tapes and a boom box and now incorporates wireless microphones and programmed music sets. Interaction with students in the audience is central to the program, Moffitt said. Before each performance, he finds out a little bit about the school and specifics about some of the students in the school in an attempt to incorporate them into the show. Members of the school’s choir also met with the team the night before and danced with them during the finale. Additionally, six Prairie Central Junior High School students were recognized during the performance as heroes for overcoming adversity and serving as positive examples for their classmates. Ryan Brauman, Brock Jackman, Rayven Kuchenbrod, Michael Hanks, Lynette Edelman and Hannah Drayer were then serenaded by the troupe. While troupe members use comedy and sketches to connect with the students, there also are moments of seriousness, including Davis’ remarks. In addition to opioid deaths, Davis warned the students about the dangers of driving while under the influence of drugs or alcohol. She also discussed suicide prevention. Also in attendance for the program was Jennifer Higgins of Geneseo. She lost her 12-year-old son, Josh, to suicide in 2013. She explained that she and Josh’s father divorced while Josh was in fourth grade. Counseling helped and he appeared to be getting back to normal in sixth grade. Higgins asked the students to find someone to talk with if they were feeling helpless or suicidal.